After playing my medium scale PRS #11 exclusively for 22 years, and then adding two custom Roscoe medium scale basses - my curiosity got the best of me - and I wondered what other high end medium scale offerings were out there. After all, variety IS the spice of life. 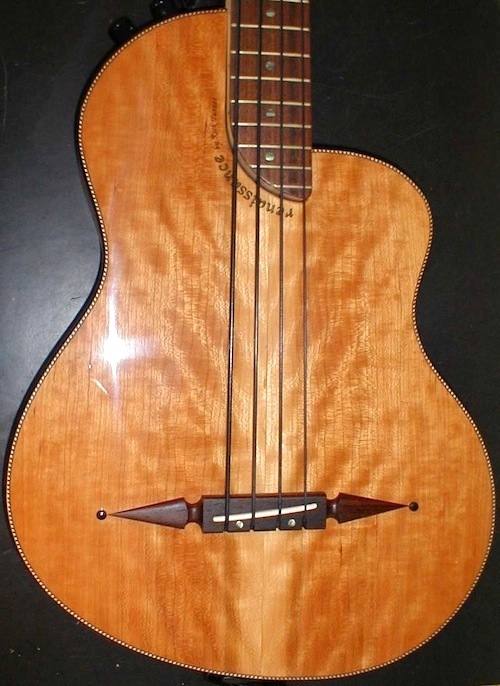 I started to do some research and found out that few medium scales were available and many luthiers were not interested in "custom" building them. This fired me up and put me on a mission to find, build, re-build, refurbish and even design medium scale basses. I feel as though it is a reasonable and even honorable endeavor, but others think I am nuts. Especially now that there are sixteen basses in my collection. So when you are a player and the amount of basses you own kind of gets out of control - you need to figure out a way to keep your instruments close at hand. I like to have mine tuned up and ready to go - at all times. I consider my basses - and the wide variety of features and sounds they provide - to be not only my arsenal, but my artistic palette. I considered all the options, but didn't like any of them. If you hang them on the wall or keep them on stands, they get dusty - and you seem to spend more time wiping them down than you do playing them. You can cover them up with with nice fabric - but what is the point of that? And even if you do, somehow, they still manage to gather dust. There is nothing worse than showing someone your instruments and handing them a dusty bass. If you keep them in their cases, they are not handy for immediate use. If you are like me, when inspiration strikes - you want to be able to make a quick choice from your palette of available instruments - do a quick tuning check and be off and running. I have several acoustic basses, so the other issue is keep them properly humidified. When they are all in a big box together it is easy to regulate the humidity of the entire box. Since I could not find what I wanted as far as a storage cabinet goes - I decided to have mine custom built. My first rule was - I wanted the cabinet to be adjustable. That way if I swap things around and sell a couple or buy a couple - the cabinet would be flexible enough to adjust to it. Unlike many players, I am not into buying and "flipping" basses. I decided to use heavy duty tool hangers from Amazon to cradle the neck of the basses. I bought a variety of nylon washers and end caps and used plastic fixtures which slide on a track rail side to side - with a set screw to lock them down when they are in position. I then bought protective foam tubing to slide over the tool hangers for extra padding and protection. You can see the one on the right has the foam tubes and the end cap in place. I ended up having the rack rails powder coated black to match the fixtures. 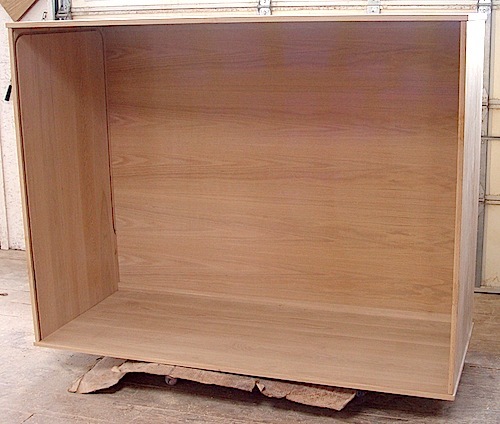 The original plan was to use a roll-top tambour door for the cabinet, because my studio space is very limited. I had sent emails to over a dozen cabinet makers in the greater New York area, but due to the tambour door they were not interested in helping me with the project. As it turns out, they were wise to pass on the tambour door part. I finally sent my plans down to Lancaster County, Pennsylvania, to see if any of the fine Amish carpenters would be interested. I found one and we got started near the end of 2013. 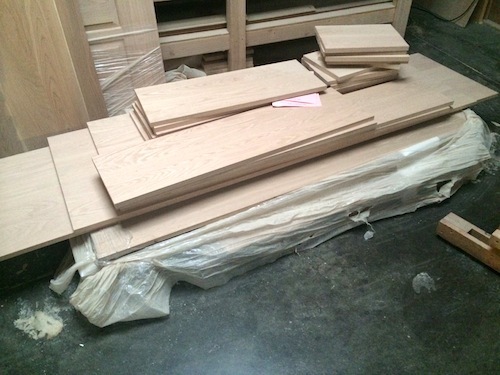 We chose white oak with a Harvest finish. 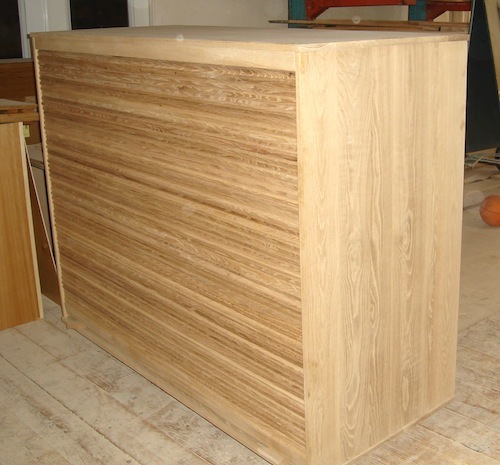 Here is the wood used for the cabinet. 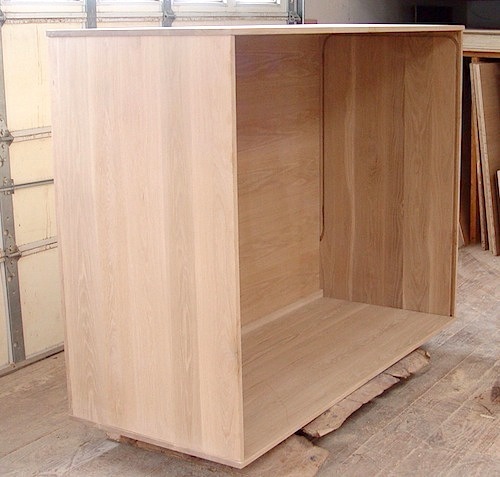 Here is what the cabinet looked like as the build began. We were summoned to Lancaster County as they had the roll-top tambour style door installed, but they found that even with substantial counter-weight the door was simply too heavy to be usable. Here is what the cabinet looked like with the tambour door on it. I loved the look and the idea of the tambour door - and it was very hard to reconcile and admit that it simply wasn't going to work. Since space is so limited in my studio the Amish carpenter suggested that we do sliding glass doors on the front - which we finally settled on as the best solution. He decided to use numerous strips of study oak to provide very attractive wood trim which also covered up the routs for the tambour door. For the bottom cradle rails, I scored a couple of rounded hand rails from Home Depot which were flattened on one side, which allowed them to sit flat on the bottom of the cabinet. These were mounted from the bottom. I then had them covered with a thick layer of very soft foam. There is no way I would let any of this foam be in direct contact with any of the basses, so I settled on royal blue velvet. Certain types of chemicals in foam can damage the finish on your precious guitars. Certain types of velvet are treated with chemicals to be flame retardant. I chose a very nice European untreated cotton velvet. It was on the expensive side but I didn't need much. I had a local tailor Rosie, who is in my office building - make custom booties to completely cover the tool hangers and also to cover the bottom rails. 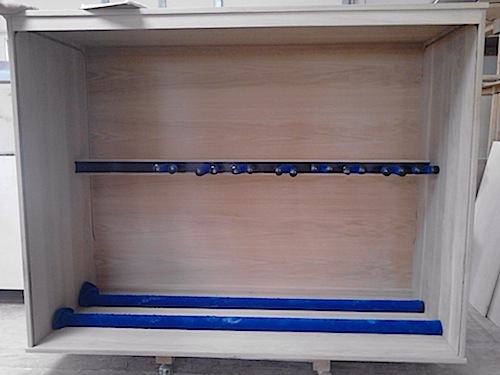 Here is how the cabinet looks with the support beam, track rails and bottom rails in position for a fitting. I took a couple of basses with me and we dialed in the exact positioning. The next step was to get the bottom rails finished and secured - and to get the glass and the glass track rails mounted for the door. There were also interior trim boards needed - to dress up the interior of the cabinet and provide additional strength. Here is how the finished cabinet looked as they delivered it in my living room before the glass was installed. And here is how it looks with the glass doors in place and the basses loaded in. It's a little tight for the acoustics, but to get 16 basses in 66" internal width is super great. You learn how to rotate the basses in and out of the case without harm. A special thanks goes out to all the folks responsible for making this happen. The cabinet looks fantastic and as a practical matter, it solves all the problems that I had hoped it would. It makes it so exciting to want to fire the studio up and play. SO GRATEFUL FOR FENDER JAPAN! I was never able to get around gracefully and with my usual "chops" on the full size Fender 34" scale bases, but when I found out that Fender Japan made a number of medium scales in the mid-eighties it was a revelation for me. They still make a new Jazz Bass model at Fender Japan in medium - and short scale as well. 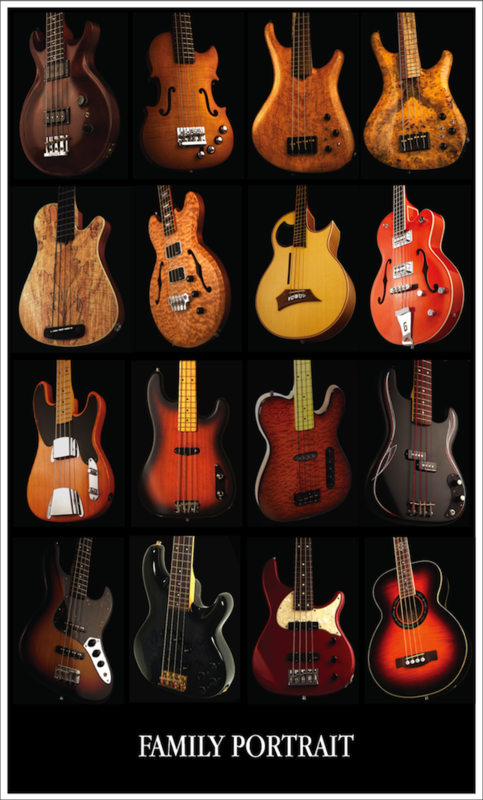 You can see what i have come up with by checking out the Gallery portion of this site by clicking on any of the basses on the left. Keep scrolling down, after the gallery photos a diary appears on the origin of each bass. Some are new and used off the rack, some have been assembly projects, some are updated instruments, and some have been 100% custom creations. During my teaching days, I had witnessed a couple of talented young bass players to be, become discouraged and give up on the instrument because the neck was too long on that good old standard Fender bass - you know the "cool" one their older brother or cousin had laying around. They used to love the lessons, as they could play my medium scale PRS and at least for a while, get around gracefully with comfort. Of course, I hated it because I had to play their dreaded long scales - which not surprisingly, rarely had a proper set-up! At least now they can pick up a widely available short scale, and if they stick with it - move up to a medium or long scale bass as they get more proficient. The first thing about me and my bass playing is that I am hopelessly old school - exclusively a four string, fretted guy when it comes to basses. 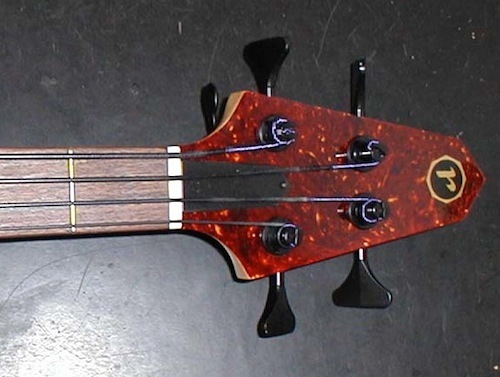 Don't play fretless - don't play five strings or six strings. I also play with a rather odd looking oversize dulcimer pick - as pictured below. I have also been known to use felt picks - depending on the hardness or softness of the sound I am seeking. No apologies. When I first started playing I used my index finger exclusively on my right hand to pluck the strings. I am a perfectionist and no matter how hard I tried or how many hours I spent, I could never get my first and second fingers to attack the strings with the exact same velocity and consistency. I finally realized that it wasn't possible. It was not a compromise I was willing to make. As soon as I discovered picks I grew thoroughly addicted to the incredible consistency of the pick attacking the strings. Since that day, I have never been anything but a pick player. It has helped to make me a very percussive player and I sometimes use my own version of a "chicken-scratch" method of picking - to emphasize the rhythm in a lot of the parts I design. A perfect example of this is the song of off "Crafty Hands" called 'I Forgot To Push It'. Much of that goes back to the early days of Happy the Man when Mike Beck was more often than not off the drum kit - doing his precision percussion - and I needed to anchor the band. When I decided to place a pick in my right hand, I continued to stroke the strings exactly as I would with my finger, in an upstroke fashion. This causes the first stroke in any new passage on any string to be an upstroke instead of the usual down stroke. The upside of up-picking is that I play sort of backwards which can create passages which can definitely be described as unique. Other conventional pick players have remarked that my faster passages can be difficult to reproduce with more conventional "down pick"techniques. The percussive attack and the up-picking give my playing a unique character. The oversized dulcimer picks are big enough to keep my index finger from blistering and bleeding - as I also play very hard. I bought out the stock that D'Andrea had in their warehouse a number of years ago - I think I have enough dulcimer picks to last the rest of my life. 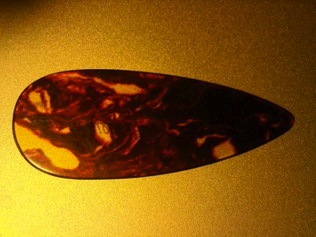 Not sure if they are making them again or not but the pick must be nearly 2" long. Happily, they only had mediums left when I bought them out - I probably prefer the heavy picks but they cause a lot more string breakage. I was fortunately blessed with a pretty immaculate sense of rhythm and I have always been fluent in odd meters. I was never sure why, even at a young age, they just seem to come quite naturally to me. When I create my own musical passages they seem to emerge more often than not in odd meters. I have always been fascinated with trying to make every odd meter I play sound as smooth as possible, with the goal of making it feel like it's in 4/4 or 6/8. When recording, if a click track is called for - I always prefer to play to the drums and let the drummer play to the click. My first real bass amp was a black face Fender Bassman I picked up used in Chicago from a guy who got drafted and needed money in a hurry. I also picked up a couple of SM 58 microphones from him for a song and a dance. We were rehearsing in a old chicken coop and someone broke in the small window and stole the Bassman amp head. Luckily, I had insurance, so I bought a new head, but it was a Sliverface, as I couldn't find another black face. 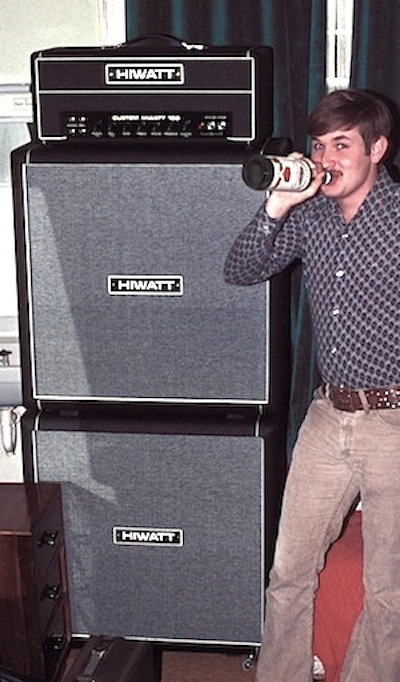 I sold my equipment when I went into the Army, but while I was in Germany I went to London and bought a nice Hiwatt stack. 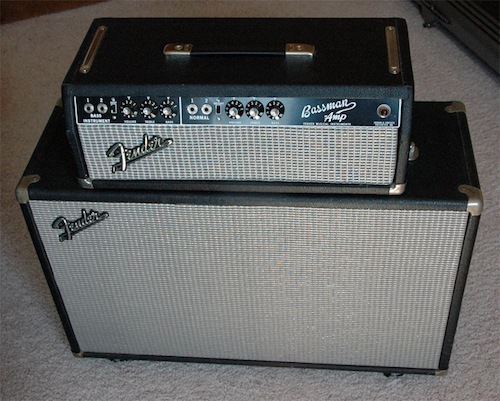 After playing a few big stages, I realized I wasn't pushing enough air and the Hiwatt stack was not adequate. I had to be way too close to it and it was too close to my ears for comfort. I unded up seeking the help of James Tomlinson, who was an employee of Washington Sound - who were Rush's sound company at the time. JT as we all called him - help design and build my first real rig. 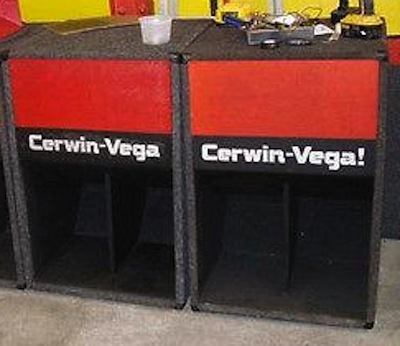 We used two Cerwin Vega 18" folded horn cabinets as above, and flipped them upside down, flipping the logo panels over too. I wanted the port to hit me in the gut so I could FEEL my bass. For the top, I told him I hated horns and tweeters and wanted something warm and round with lots of dispersion for the mids and highs. 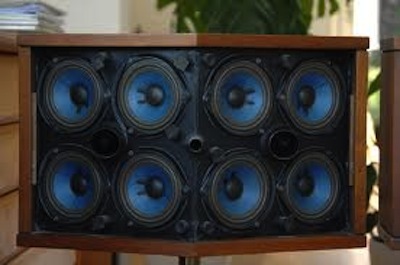 JT built a special crossover of his own design and suggested these Bose 901 cabinets with 9 - 4.5" speakers for the top. The sound was warm and rich and the dispersion just couldn't be beat on a big stage. This was my rig for most of the "Happy the Man" touring days, although for smaller dates I would only take half of it. We used an Ashley SC-40 preamp along with a DBX 163X for speaker protection. It was a thumping rig, if I need to gear up again, I would definitely consider a modern version of this if we were playing big stages. 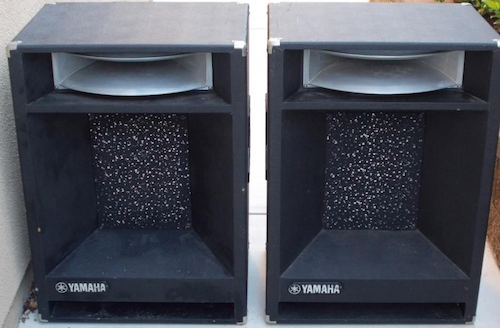 Happy the Man had purchased a couple of powered Yamaha A4115H PA speakers, with large casters, which Kit Watins used as his stage rig. When the band broke up, as part of the settlement, I inherited the cabinets. I still had a power conditioner, an Ashley SC-40 preamp and a peak limiter in a rack for speaker protection from my former rig, so for giggles one day I plugged it all in, rolled the horn volume way back and checked them out. Surprisingly, they sounded great, just clean Yamaha power and clean tight low end. No tube grit or anything but they were full and rich on the bottom end. I played around with the horn level, just giving each cabinet a pinch, and they really came alive. The band loved them and I had one for each side of the stage. We had the original cardboard boxes they shipped in, so we trimmed off the top of the boxes neatly and slipped them over to use as covers. They stayed in perfect condition and we wheeled them around - serving me very well for a quite a few years without problem one. Happily, my ears are still in really good shape, as I refused to ever have my rig or even my monitors pointed directly at my ears. I loved the sound to be full but peripheral. You can see the rig behind me above. A number of years ago, I had an elderly native american statesman and jewelry maker in New Mexico make me five "heart with wings" pins. They were cast out of sterling silver, mother of pearl and blood stone. I like to feel that winged heart over my heart when I play. It is very sentimental and reminds me intuitively of things which are sacred to me. I have always used these pins on my straps but the clips holding them on always fell off and got lost. I was so thankful to find out about the ideal guitar straps handmade by Bob at Brookwood Leather. Above are the two straps he made for me. Bob and I came up with a great solution, which was to bend the pins over and sew the back lining layer of leather right over the pins so they can't come out. Before I discovered Brookwood, I have always thought that my bass straps were a compromise. I had a number made by custom leather crafter's over the years, but when the straps came back I was always disappointed. 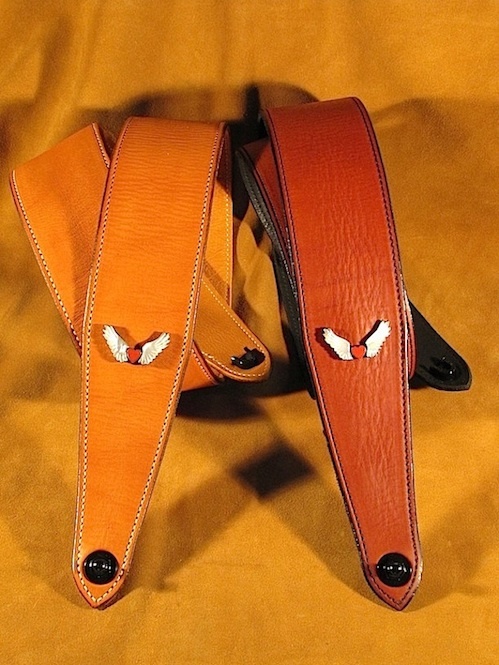 The problem may be that custom leather shops - as good as they may be at their craft - don't always have the knowledge and insight to know the subtle features that need to be part of a quality world-class bass strap. It may seem like a simple process on the surface, but like most everything, the devil is in the details. I don't like adjustable straps, my strap length doesn't change from bass to bass. This eliminates about 95% of the straps you find in the stores. I finally stumbled on to the Brookwood Leather web site by accident one day, and I couldn't be happier with my bass strap situation. I am sure you will appreciate the quality and durability of the custom straps created by Brookwood. Bob is a genuine craftsman and there is no end to the detail and level of customization he will provide for you. He has a great website with a comprehensive batch of photos which frame his leather designs here. If the bass you play does not give you healthy doses of inspiration, you might be playing the wrong instrument. After all, inspiration is the holy grail. By all means, find and play an instrument that fits you properly. It's funny how inspiration is so elusive and how one person's inspiration can be another person's yawn. 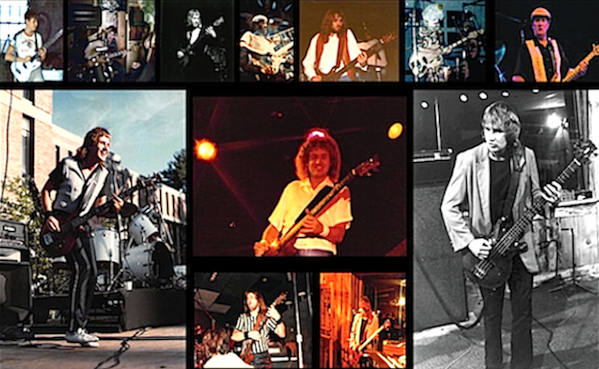 The first two bass players to truly inspire me were Paul McCartney and Chris Squire from Yes. The way they played just seemed to connect with me. I spent lots of long hours playing the parts they wrote - and in my formative stages tried my best to think like they did when I was composing my bass lines. There have been many other inspiring players along the way, but the two that always stood out to me the most were James Jamerson and Carol Kaye. The first bass instruction book I ever bought and worked through was from Carol Kaye. "I think most guys who went right to electric don’t have the hand strength, so it’s hard to get that upright sound. Probably the most important reason, though, was that I always picked with just my index finger, and that gave me an evenness and consistency in my sound. It didn’t matter what kind of instrument I was playing. It always sounded like me." One could convincingly argue that his amazing body of work by itself constitutes everything you need to know about pop bass playing. No player has influenced more bassists, except perhaps Paul McCartney, who himself often credits Jamerson as his biggest influence, so there you go. The cruel irony is that Jamerson toiled in obscurity throughout the 1960s and well beyond—Motown didn’t credit studio musicians on album sleeves until the early 1970s, and most bassists didn’t know him by name until the 1980s and 1990s, by which time it was too late—Jamerson passed away in 1983 at age 47. Even a brief survey of the Motown work he did with the Funk Machine is a veritable hit parade: “You’ve Really Got a Hold on Me,” “Going to a Go-Go” and “I Second That Emotion” (the Miracles); “My Girl,” “The Way You Do the Things You Do” and “Ain’t Too Proud to Beg” (the Temptations); “Can I Get a Witness,” “Pride & Joy,” “I Heard it Through the Grapevine” and “What’s Going On” (Marvin Gaye); “Heat Wave,” “Dancing in the Street” and “Jimmy Mack” (Martha and the Vandellas); “Fingertips Part 2,” “Uptight,” “I Was Made to Love Her” and “For Once in My Life” (Stevie Wonder); “Bernadette,” “I Can’t Help Myself” and “Reach Out I’ll Be There” (the Four Tops); “Where Did Our Love Go,” “You Can’t Hurry Love,” “I Hear a Symphony” and “Stop! In the Name of Love” (the Supremes); and a great many others. 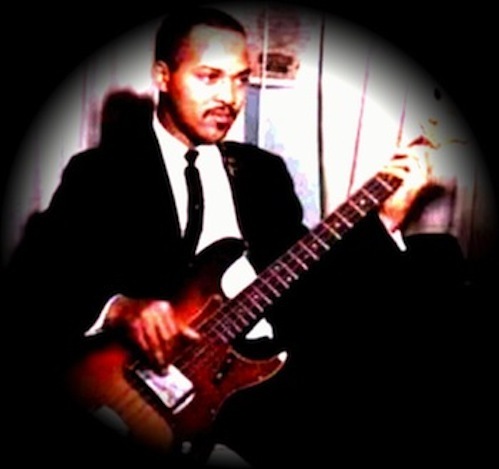 Jamerson acquired the Funk Machine new in 1962 after his first Precision, a gift from fellow bassist Horace “Chili” Ruth, was stolen. The other cruel irony is that the Funk Machine itself was stolen mere days before Jamerson’s untimely passing, and its whereabouts remain unknown to this day." It was very gratifying to hear that one of the most remarkable bass players in the history of pop and rock music, Carol Kaye - also used a pick. I realize that the mere mention of her name causes quite a controversy among bass players. She has claimed that she played on many of the same tracks that James Jamerson had claimed ownership to. Unfortunately for her - this has really hurt her popularity and credibility in certain circles. I think it is easy to understand and explain the discrepancy - Carol was in L.A. and Jamerson was mostly in Detroit. It has been reported that various demos, and early versions of the songs were circulating back and forth - and many times the rhythm tracks from the demos were eventually used in the masters. If the master sheets and tape boxes were not properly marked - even the most discerning engineer would have had trouble figuring out who played on what. It also makes sense to me that at times, no one really cared enough to pay attention to who played on the final versions, since there were no liner credits in those days..
"Some particulars of the Carol Kaye method: she uses flat wound strings and a pick - as opposed to her fingers like many other players do now - positioned in a certain way: on her left hand (her fretting hand) she uses her pinky finger instead of her ring finger to reach higher notes. Carol is first and foremost a jazz musician and her actual playing ability far exceeded the material she was paid to do. She thought rock was fun but kind of "kids stuff." 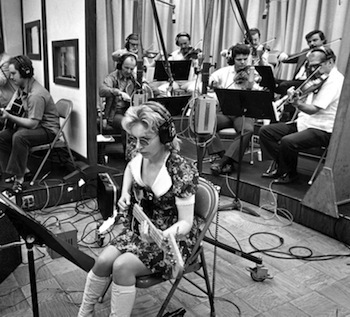 "Carol Kaye was already a busy L.A. bebop jazz and session guitarist when, in 1963, she first picked up a Precision Bass when the scheduled bassist failed to show up for a recording session at the Capitol Records building. She found that she loved playing bass, and by the end of the year she had joined Pohlman as one of the city’s top first-call session bassists. She played on pop hits, film scores and television themes throughout the 1960s and 1970s far too numerous to list here comprehensively, but a short selection would include, in addition to her work on Brian Wilson’s sessions, songs by Jan & Dean, the Righteous Brothers, Sonny and Cher, Andy Williams, the Monkees, Paul Revere & the Raiders, Joe Cocker and Ray Charles, and music from Mission Impossible, Airport, In the Heat of the Night and Guess Who’s Coming to Dinner." To me, it is a fairly easy process when listening to solo bass tracks to hear the difference between Carol Kaye, admittedly a pick player 100% of the time - and Jamerson, who only plucked with his index finger. Either way, these two amazing bass players revolutionized the instrument in countless areas. My greatest fear as a bass player is that I would begin to play licks and passages which would brand me as a frustrated guitar player. Many years ago, Paul Reed Smith made a super nice guitar for me, but I eventually sold it - I didn't even want to be tempted. I have always been and will always be a bass player, plain and simple. Please enjoy the site and thanks for reading and if you have any questions or comments drop me a note here. I would love to hear from you.